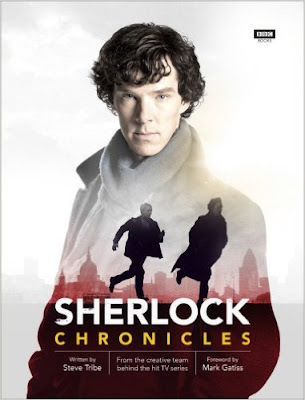 If you are a fan of the BBC show Sherlock this is a must have book for you! If you haven't seen the show yet, but are a Sherlock Holmes fan, there are fun things in here for you too-and shame on you for not having seen Sherlock! As a die hard Sherlock Holmes fan I can tell you that Sherlock is one of the best things I have ever seen! This book contains so much great stuff. There's a history of how the show came to be, and some interesting history on Sherlock Holmes as well--from the original stories, to TV and movie history. I have been a fan of Sherlock Holmes since I was a teenager and found interesting info in this book that I didn't know about. Now if you are a fan of Sherlock, the rest of the book is for you. There is background on how Benedict Cumberbatch and Martin Freeman were cast as Sherlock and Watson which was a lot of fun to read, info on other characters and actors, info on all three seasons that have aired thus far, scripts, deleted scenes and a ton of wonderful photos and fun tidbits! Everything that you ever wanted to know about Sherlock is here in this beautiful book that would make an awesome gift for any Sherlock fan!